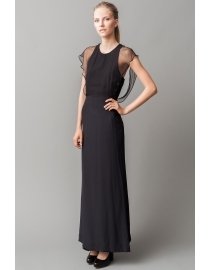 Silk gown with deep front opening, and a draped skirt. It has a metal buckle in the center front that holds the chain accessory. The macramé details which are handmade by women in Moldova and cut-outs in the back set a rich beauty to the dress.